What do you think of when someone mentions “Croatia”? 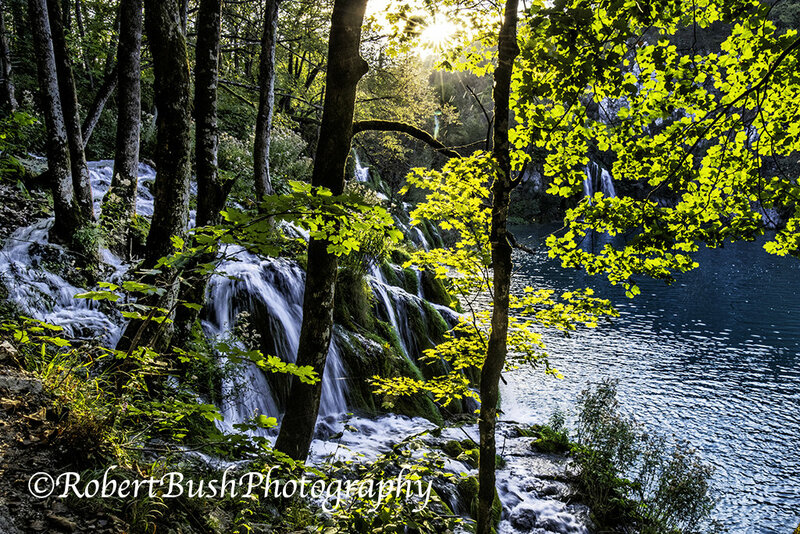 Although Croatia is an increasingly popular international travel destination, that is a recent phenomenon. I suspect that many of you, like me, really have no idea at all about what Croatia is like. So I thought it might be of interest to see some photos and hear some stories about the journey we are currently on to Croatia. I will try to keep the words to a minimum – but it may be worth setting the stage a bit. As I write this, Peggy and I are on a 3 1/2-hour ferry trip across the Adriatic Sea to Rovinj, Croatia from Venice, Italy where we just spent three days. Venice is directly across the Adriatic from Croatia and is therefore a convenient place from which to get to Croatia. It is also a historically apt starting point for a story about Croatia since the northern part of Croatia was once part of the Venetian empire. 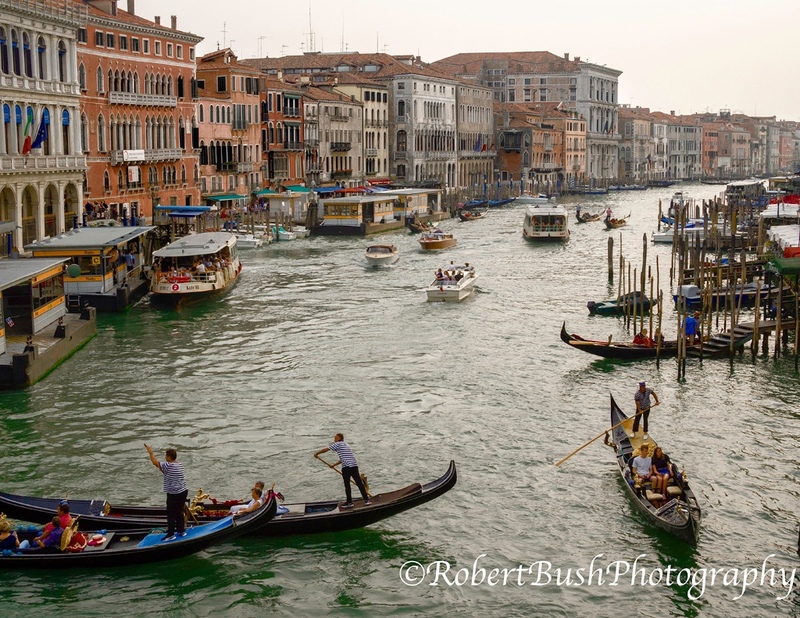 The Grand Canal, Venice, from the Rialto Bridge. 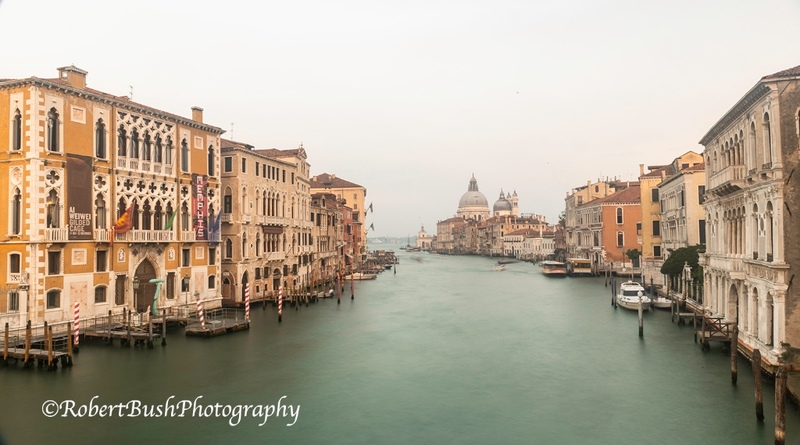 The top picture is also of the Grand Canal, taken from the Academia Bridge. Venice is also an apt starting point for a little historical background about Croatia. Although most of us have never visited that part of the world and might not have any idea about what it is like, it is much more likely that we do remember the horribly violent breakup of Yugoslavia in the 1990s that introduced us to the term “ethnic cleansing.” Ultimately, that breakup resulted in the creation of Croatia, Bosnia and Herzegovina, Serbia, Montenegro, Slovenia and Macedonia. 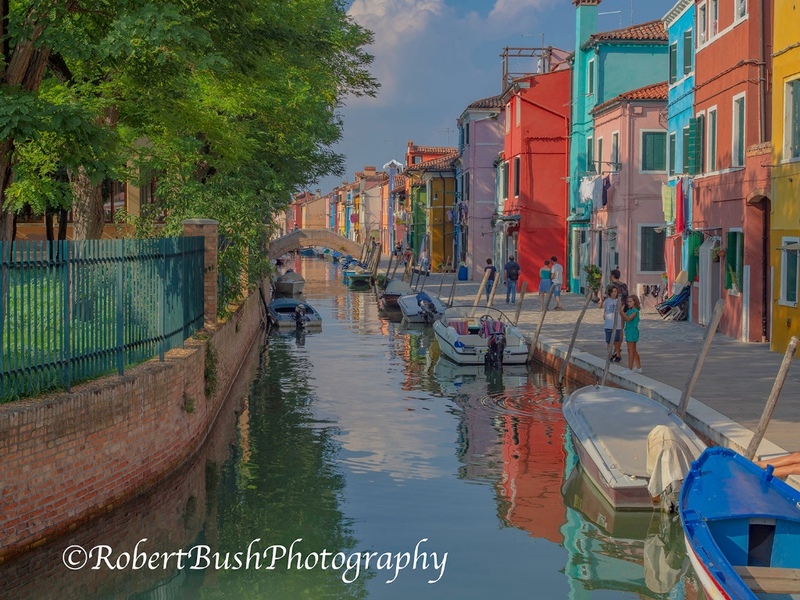 The island of Burano is a 45 minute vaporetto (water taxi) ride from Venice. It is known for these brightly colored houses and lace, which has been made there since the 16th Century. 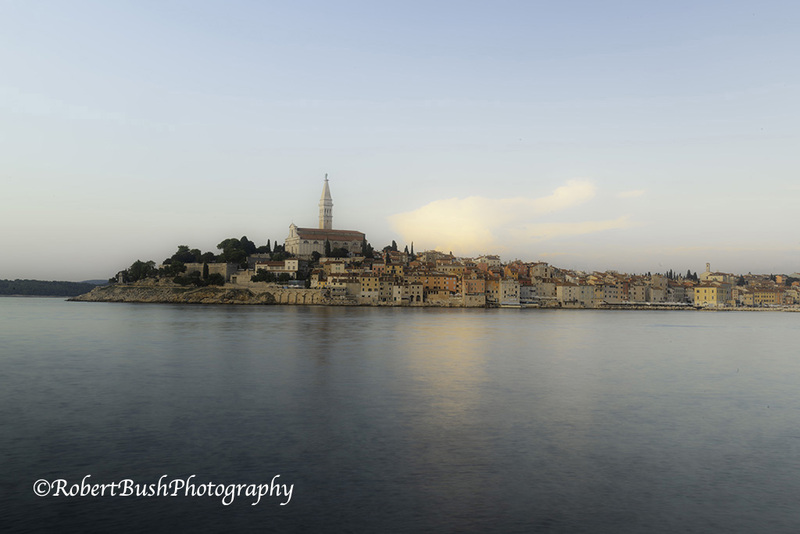 Its just a little under 4 hours by ferry from Venice to Rovinj (pronounced Roh-VEEN), which is pictured above. 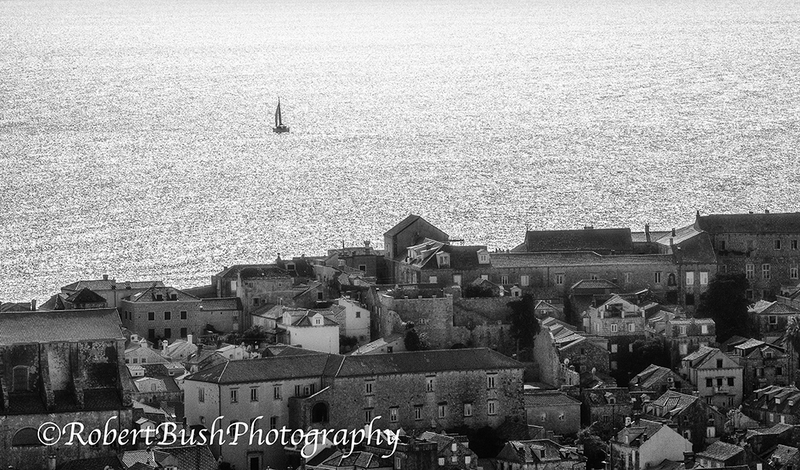 Rovinj is a beautiful small town on the coast of Istria, the wedge-shaped peninsula in Croatia’s northwest corner. Like much of Croatia, Istria has a rugged coast line with medieval towns – like Rovinj – scattered throughout. 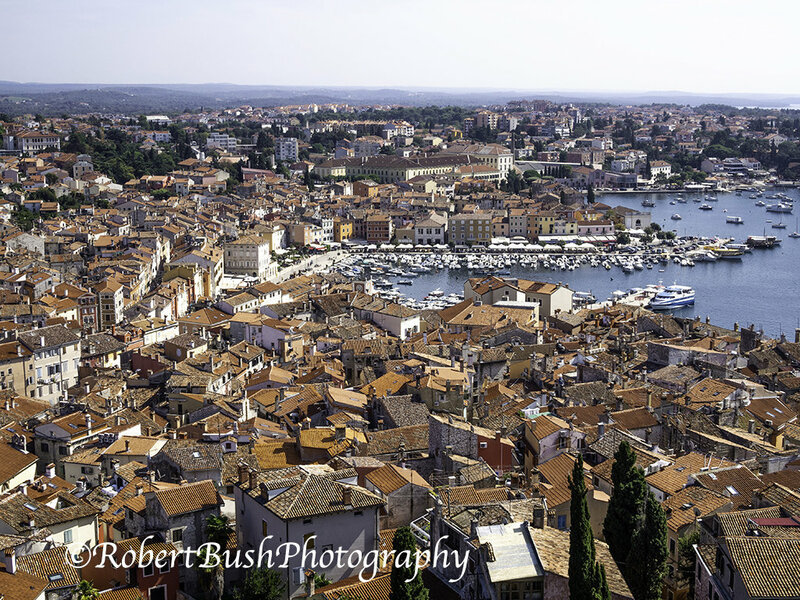 Although it is just a short ferry ride across the Adriatic from Venice, Rovinj is a far cry from that city. 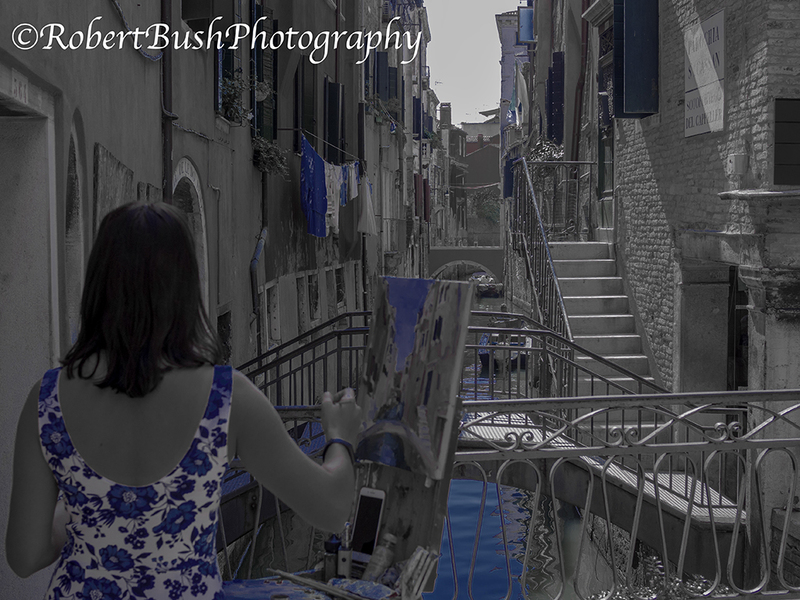 Venice is a living museum – crowded with hordes of tourists, everyone with a camera in hand. 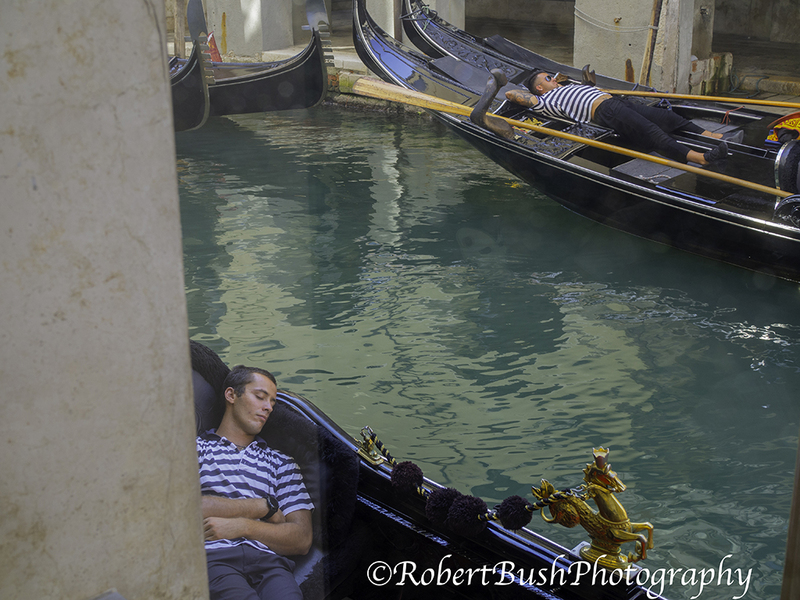 Other than working in the tourist related businesses (restaurants, hotels, museums, gondolas, etc), people just don’t live and work in Venice any more. Rovinj is very different. Although it has vibrant tourism industry, you get the sense from the beginning that you are visiting a town where people live and work. 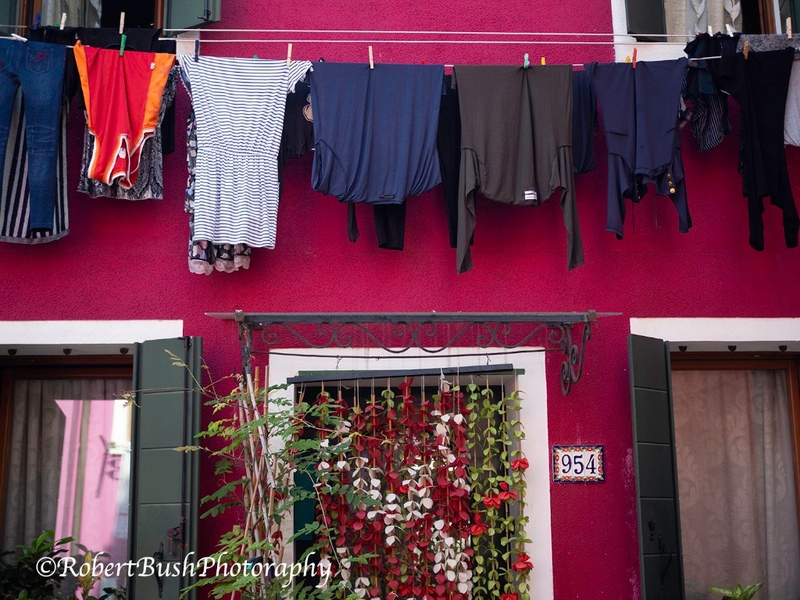 The narrow streets of its old town don’t have the high-end stores of Venice – but instead are small, locally owned restaurants and shops. Our first night was the last night of the Wine Festival – and we were treated to a wonderful evening concert of Croatian music just across from our hotel. The fact that much of the crowd could sing along made it clear that the crowd was Croatian. Croatia only has 4 1/2 million people – and you could get some feeling for the national pride from the crowd singing together on a warm summer night. 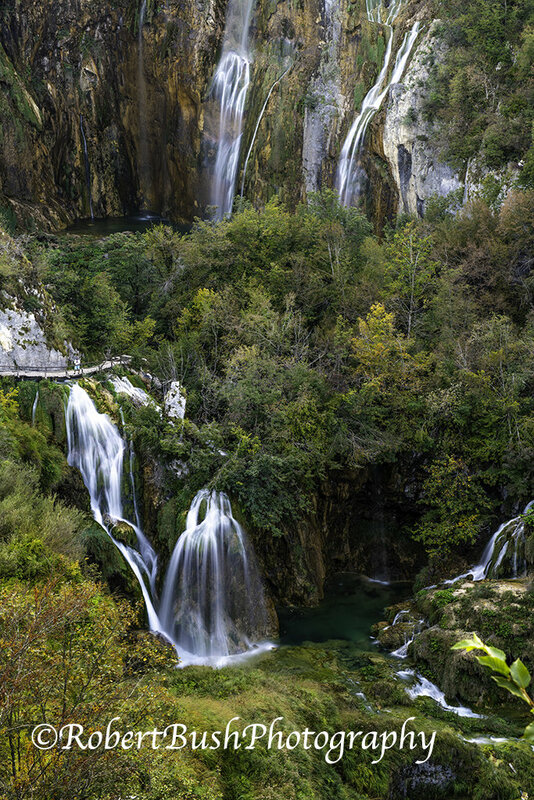 From Plitvice, we drove south through Istria toward Split on the Dalmatian Coast, where we will begin our bike ride down the coast. We passed through very rugged mountainous area near the borders of Serbia and Bosnia. Bullet holes could still be seen on the sides of houses. The land is incredibly rocky – mile after mile of very green shrubs and trees – but no pastures, no crops. There just isn’t room between the rocks. There are few shoulders on the roads and when I did try to stop and take a picture, a woman working a honey and cheese stand shooed me away. You can get some sense of the countryside from the picture below. 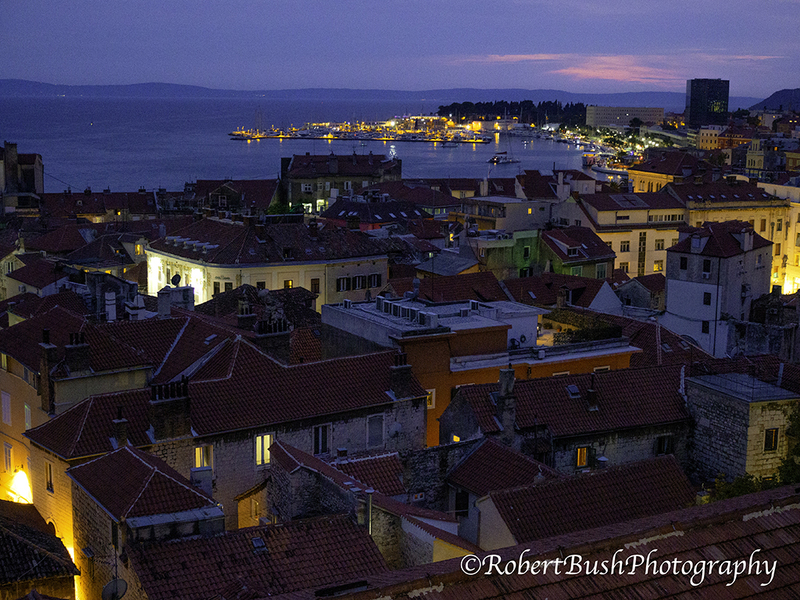 Next stop, the Dalmatian Coast. 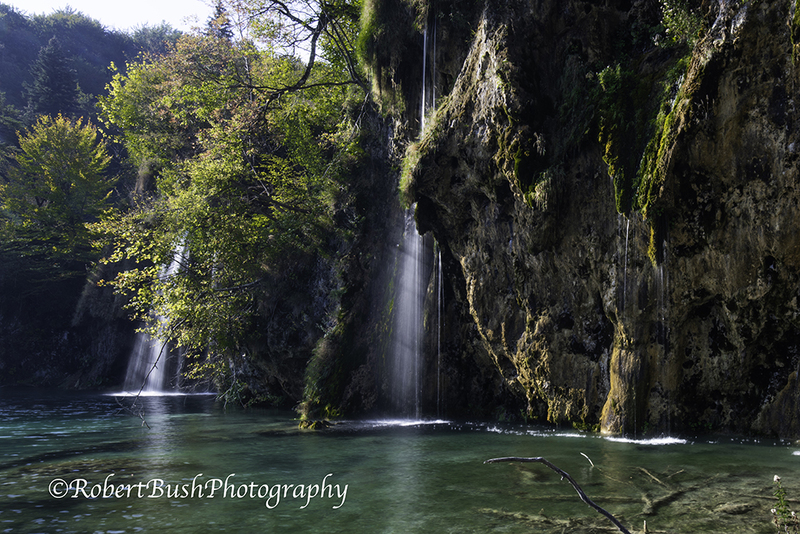 After leaving Plitvice Lakes National Park, we headed southwest to the Dalmatian coast of Croatia.Our first stop was Split, Croatia’s biggest city (after Zagreb) and there we – Peggy, and my cousin Margie and her husband Rich – started our bike ride that will take us from Split along the coast to Dubrovnik. From our base in Split, we took a day ferry to the nearby island of Brac and then moved over to the island of Hvar where we spent two nights. We are now on the island of Korcula. 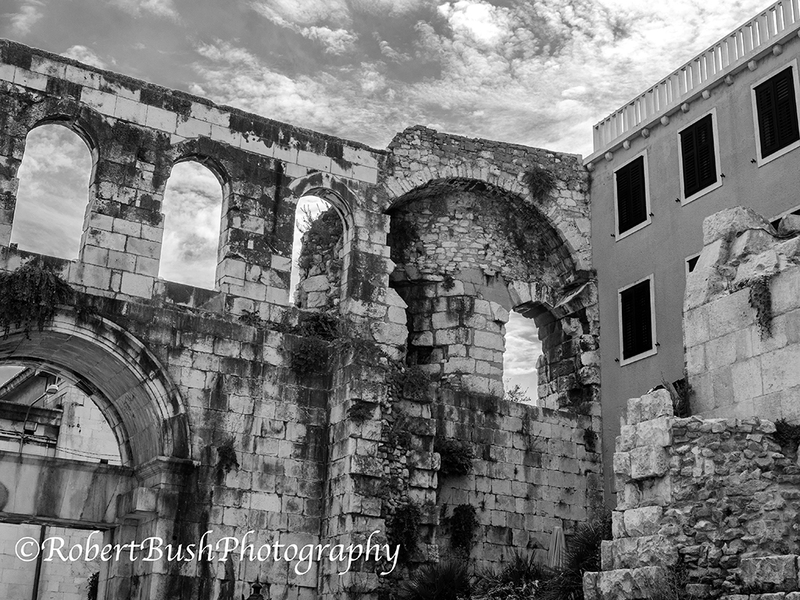 It says a lot about the history of Croatia that the most historically significant building in Split is something that was built by someone who conquered the area. The Roman Emperor Diocletian built this palace in Split in about the year 300 A.D. Incredibly, almost two thousand years later, large portions of that Palace still stand and the ancient Palace walls have been incorporated into the buildings of the modern city. The top picture is taken in the evening from the ramparts of the Palace’s walls, just a stairway up from our first hotel room that was built within the Palace walls. 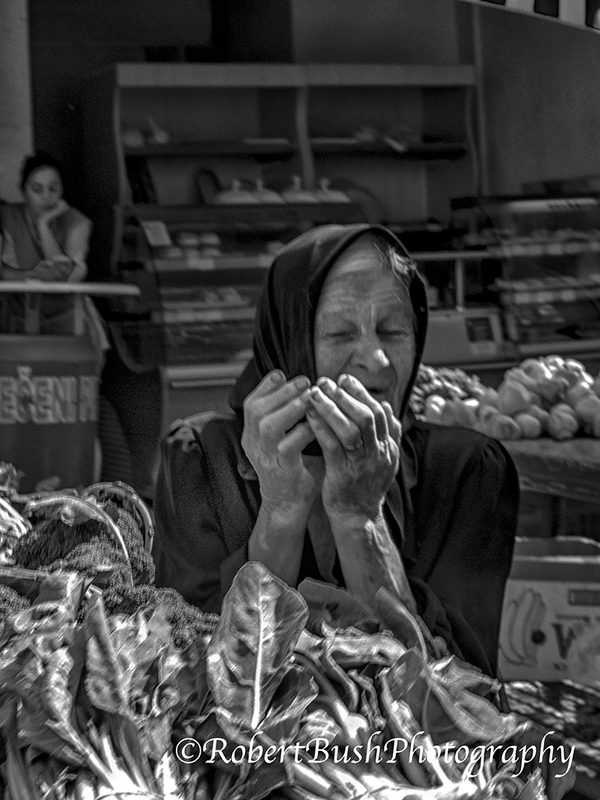 The face and hands of this woman in a Split marketplace are a reminder that despite the sailboats, ferries, some cruise boats – and port areas filled with shops and restaurants like those below in Hvar town – that modern Croatia is not far removed from a different reality. Although not spectacular structures, these terraces that cover much of the land of the Dalmatian Islands were to me perhaps the most fascinating part of the Croatian historical structures. The terraces that cover the islands were first built by the Romans, then by the Greeks, and then by Slavs during the Middle Ages and so many of these stone terraces are over a thousand years old. Although the terraces are abandoned now, the terraces suggest life in another era, when most people lived in these inland areas for safety and cultivated olives, grapes, figs, almonds and vegetables in these small plots of earth that had been cleared of rock. 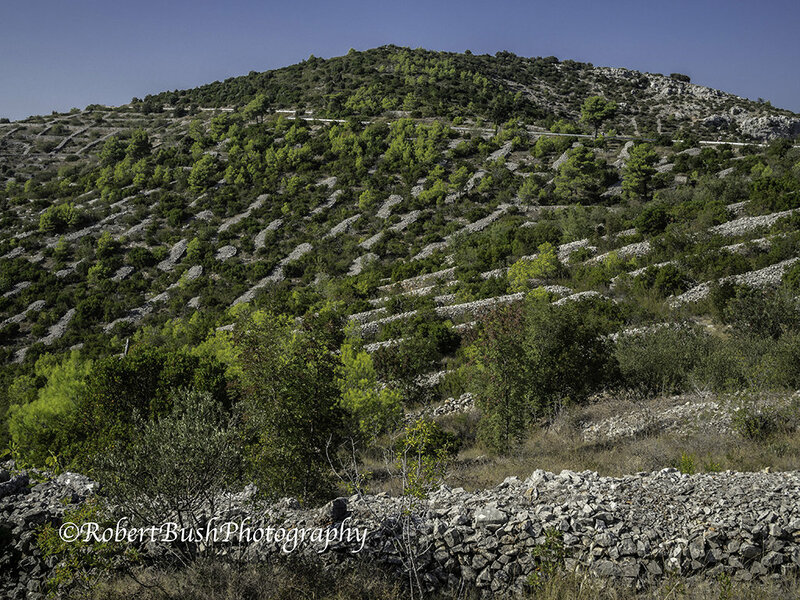 This image above and below are on the island of Hvar, As we were biking, we passed mile after mile of rocky hillside land covered with these ancient terraces. Dotting the terraces are small stone buildings. Some, like this one, were clearly for religious purposes. Others served as shelters for animals or those working in the fields. 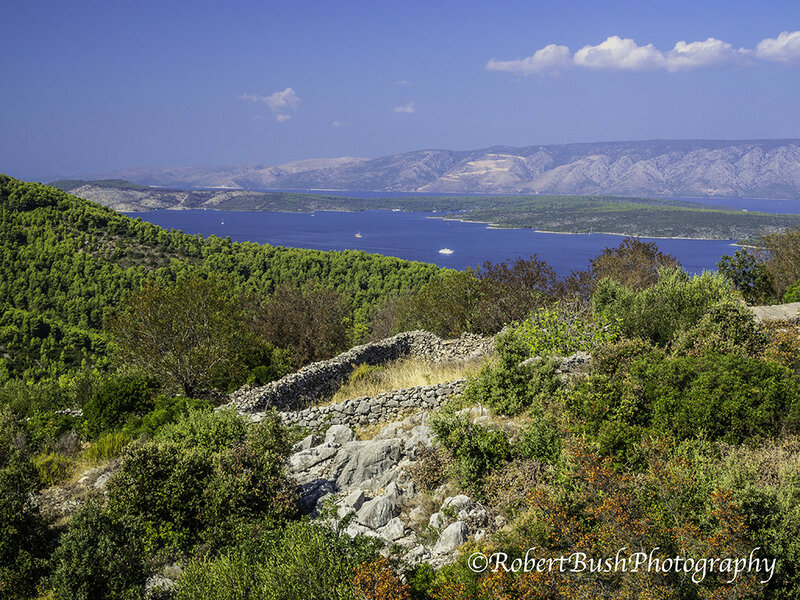 Panoramic view of the Adriatic and neighboring islands from the island of Korcula. One more day of biking. After a short ferry ride across a channel from the Island of Kortula, we ride almost 40 miles down the Peljesac Peninsula to Dubrovnik. Our last day of biking was the toughest – but one of the best. From the island of Kortula, we took a short twenty minute ferry across the channel to the Peljesac Peninsula that juts out into the Adriatic from the mainland of Croatia. Then we rode 38 very hilly miles down that entire peninsula. The best part of the ride was on the narrow farm roads that snaked through some of the best wine growing regions in Europe, with distant mountain tops layered in the distance before us (see picture above). 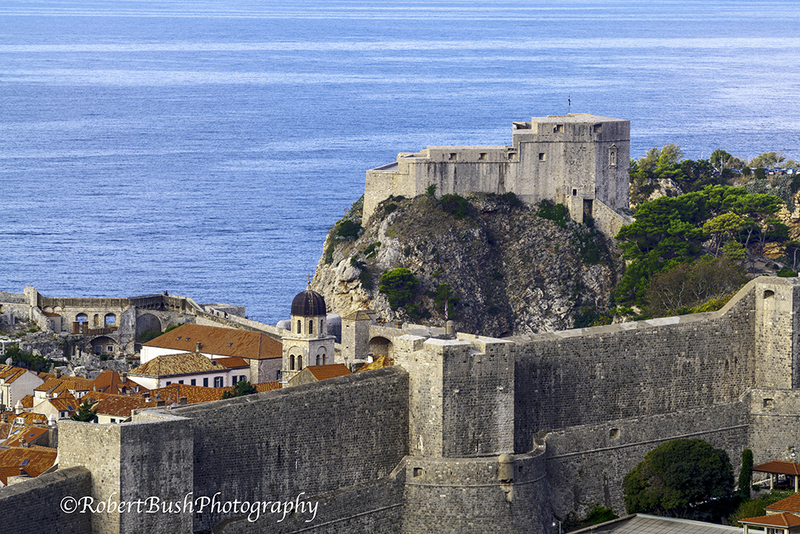 The ride – and our trip – ended at the walled city of Dubrovnik. Dubrovnik was one of the economic powerhouses of the Middle Ages – and now is one of the most famous television sets in the world as the setting for Kings Landing in Game of Thrones. Although very small, Dubrovnik used its strategic position – defended by these fortified walls and also by clever diplomacy – to build an economic powerhouse that rivaled that of Venice.during the 15th and 16th centuries. Rather than keeping people out, those walls now attract hordes of tourists that fill the narrow streets to overflowing in July and August. Medieval walls are no match for Game of Thrones. Nor do those walls keep out external cultural influences. As we were driven through the narrow roads toward the ancient town of Dubrovnik, the Croatian radio station played some of the a cappella Croatian music we had become familiar with. And then, Tom Petty. When we got to our hotel, we turned on the TV in our hotel room – to see the Kavanaugh hearings being shown live. So much for walls. Today, these walls are hardly better protection against military aggression. 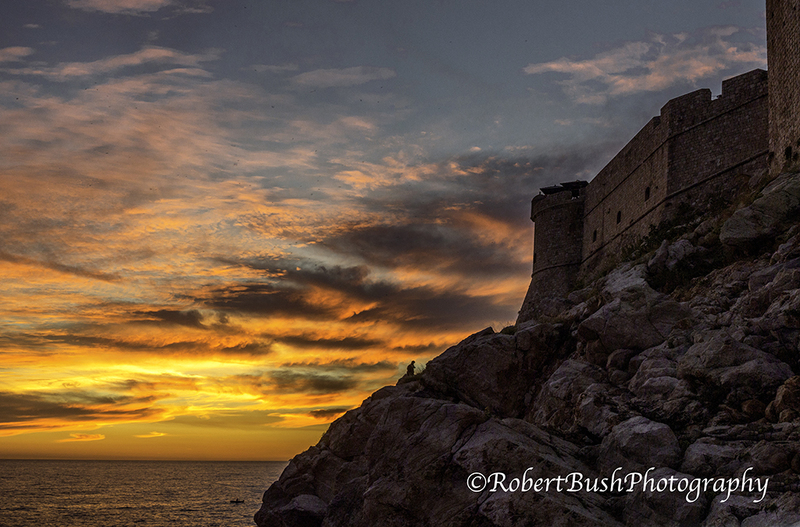 In the Yugoslavia wars of the 1990s, Dubrovnik was bombarded. You can see the extent of the destruction now indirectly – since the bright red roofs that you can see in the images above and below are all newly built to replace roofs destroyed in that siege. 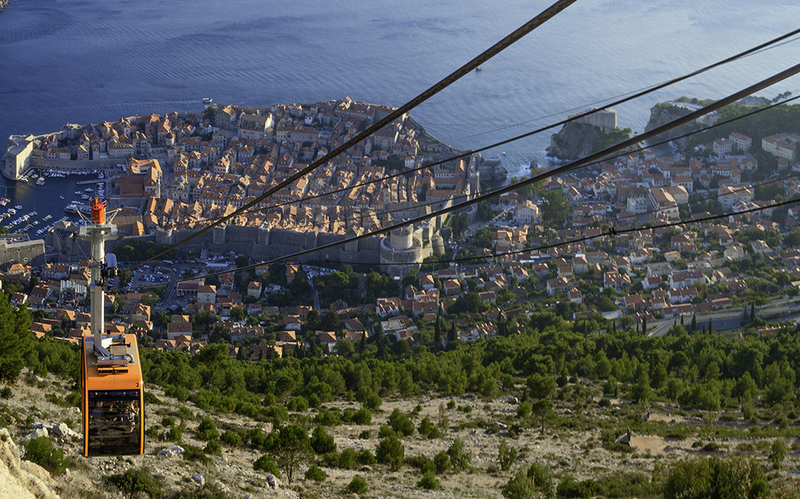 A tram takes visitors to the top of Mount Srd that towers about 1200 feet above the walled city. It was a scene of intense fighting in the Napoleonic Wars of the early 1800s and once again during the 1990s Yugoslavia wars. A museum there documents the fighting. 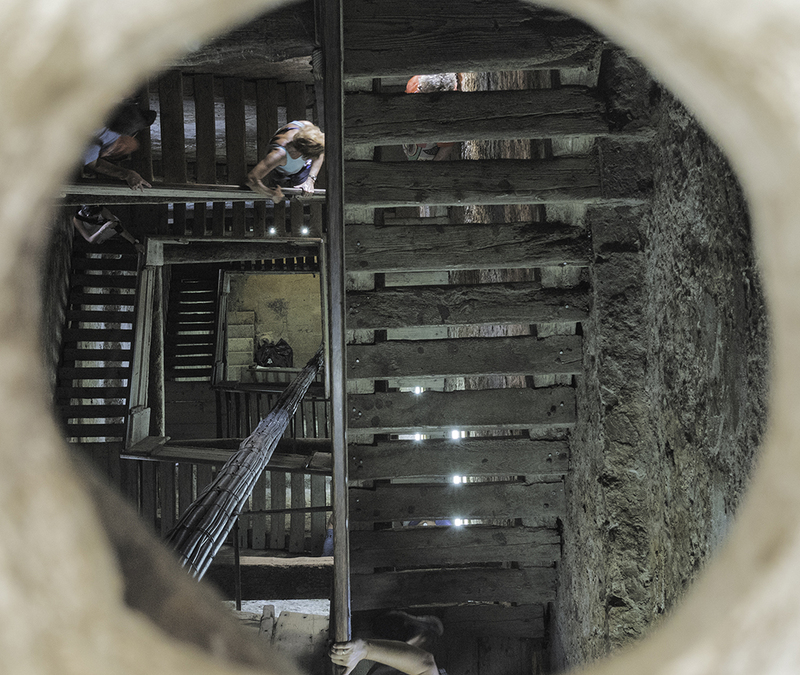 It is more than a little discouraging to note from the language used in the museum exhibits that the hostility toward its neighbors appears to be undiminished. And that brings me to the end of this journey. I leave you with a few photos that did not quite fit into the narrative of these four newsletters of our trip. And for those with an interest in perhaps traveling to this area, I will conclude with a few remarks and impressions. 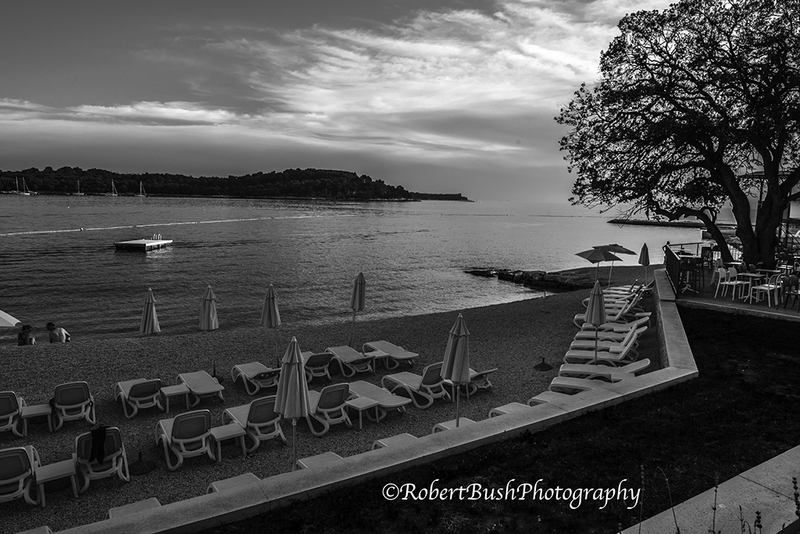 Beach on Katarina Island just a few hundred yards off the coast across from the Istrian town of Rovinj. The rocky beach and old fashioned hotel feel like a throwback to the Tito era. 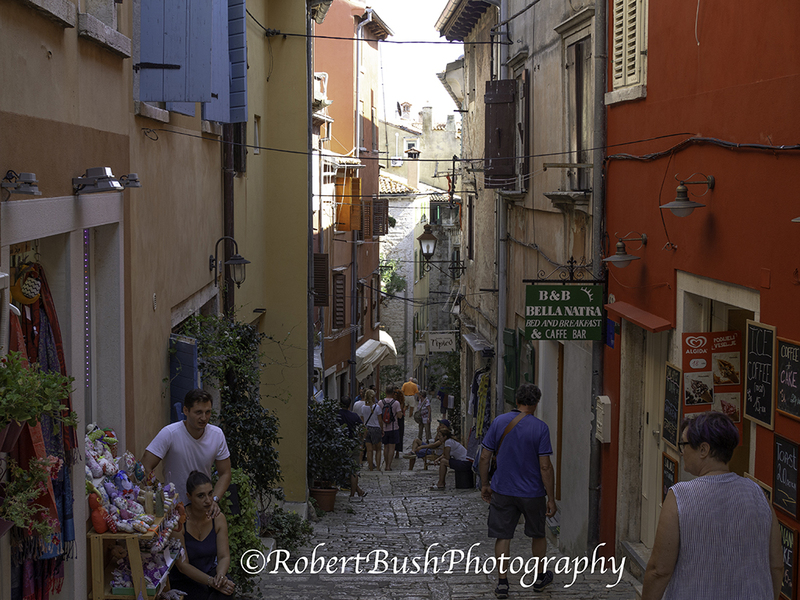 Narrow streets of Rovinj. The same kind of street scene can be seen in every old town in Croatia – narrow limestone paved walkways lined with small shops and restaurants. 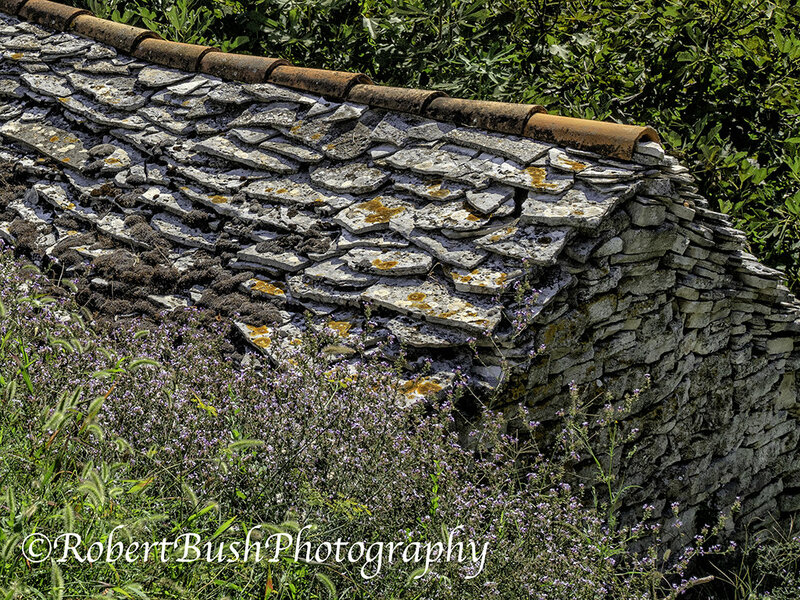 A stone hut – with a stone roof. 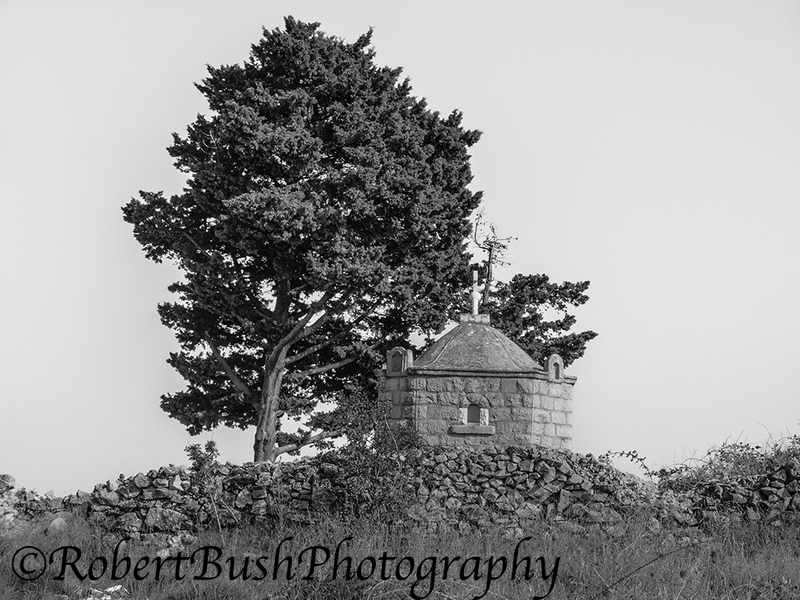 This hut was on Hvar Island – but similar huts dot the landscape everywhere. Everything was built of stone which was both plentiful and needed to be cleared from the rocky soil to make room for crops. 1. Politically and geographically, the Balkans are rocky and rough. As for the geography, we learned how tough that is from personal experience on a bike. It seems that there is hardly a flat road in the whole country. The mountains extend inland and right to the ocean’s edge. 2. The land is incredibly rocky and inhospitable to agriculture. Everywhere it was necessary to laboriously clear rocks from the ground to create enough space to plant anything (although I understand that there are some inland areas that are less so and can support larger scale farming and raising cows and other domestic animals). There was no large scale agriculture in the entire area from Istria in the north to Dubrovnik in the south. Instead, you find steep hills, with rock fences and piles of rocks that had been laboriously removed from the ground for a thousand years. Grape vines, olive trees and some fig trees – and occasional small vegetable gardens – appeared to be the only agricultural crops. 4. Cruise boat tourism is degrading places like Venice and Dubrovnik. In July and August, literally rivers of people drag you along the streets. When we were in Venice in September, the crowds were pretty bad but apparently not as bad as the earlier summer months. 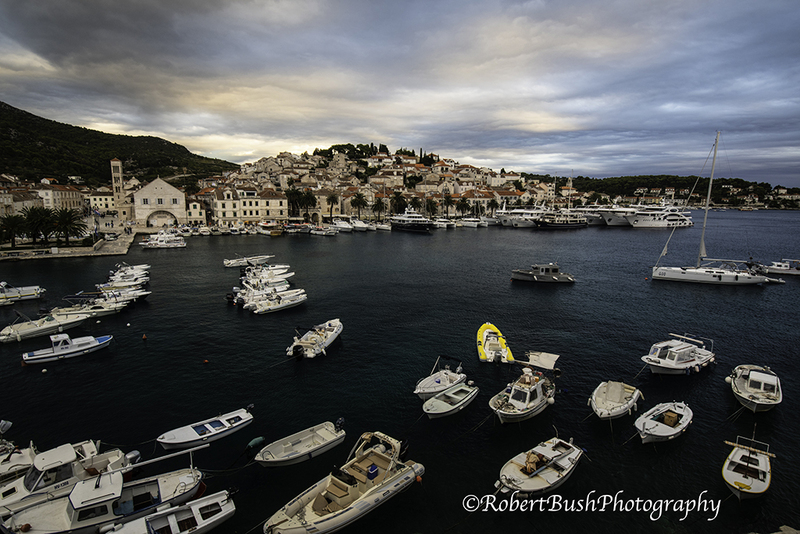 Even though it was fall, Dubrovnik was pretty unbearable when cruise ships were in town. As a result, locals are moving out and the places are turning into historical theme parks. Restaurants and hotels have little incentive to maintain standards since they know they can fill up anyway. 5. I had the uneasy feeling that the centuries of wars in this area are not miraculously over This was not from anything I experienced but rather from what I read about the recent rise in right wing nationalism in the country and from small hints, like the description of the Yugoslavia wars in the Dubrovnik museum on Mount Srd – which contained only aggressive nationalistic descriptions of a complicated political situation – one in which Croatia was not an innocent party. Think about how Israel or the Palestinians might describe their mutual histories – and multiply that by a thousand years and multiple major wars..
6. For anyone interested in a bike trip, the huge popularity of those trips attest to the beauty and interest of such a trip. The biking is not easy because of the hills – and because of the heat during the summer and fall There are no shoulders along the roads, but many of the roads we were on were small rural roads with many more bikes than cars. There were only a few major roads where we traveled for short distances where the cars were uncomfortably close and traveling a higher speeds than I would have like. 7. All in all, Croatia is an interesting and wonderful place, with an incredible history.